The Meat Industry’s Clean Little Secrets - Dalton & Co. In 1906 Upton Sinclair published his novel The Jungle, a fictional story featuring real health concerns within the American meatpacking industry. As a result, President Roosevelt sent his Labor Commissioner along with a social worker to plants in Chicago to investigate. They were horrified to confirm most of what Sinclair depicted. Workers stood on bloody floors in hot, unventilated rooms. There was little to nothing being done to keep rats out. They even witnessed workers rescue a slaughtered hog carcass from a toilet and put it on a hook for processing without even washing it. Thankfully, things have changed in the last 100 years or so. A lot. It’s fair to say it was not common knowledge among meatpacking workers of the day that meat in a dark, hot room was an ideal environment for bacteria. Today, workers in meat processing plants understand very well how important it is to clean, clean and clean some more to maintain safe working conditions and a safe product for consumption. U.S. meat processing plants today look like they could be attached to a hospital. Workers cover their bodies and clothing with rubber coats, plastic caps, gloves and booties. 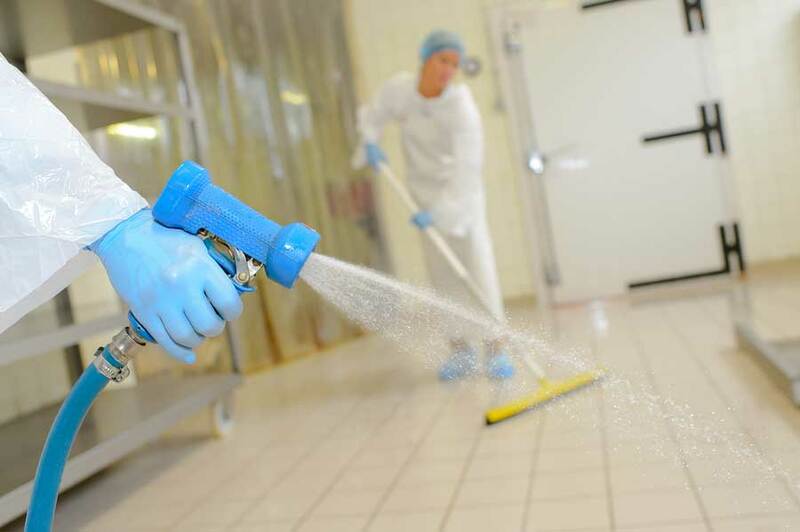 Meat processing workers don’t just clean floors, counters and other exterior surfaces regularly. Taking machinery apart to thoroughly clean every component is a nightly (or early morning) chore. Pressure rinse, soap and scrub. All product debris from those nooks and crannies, in which microorganisms love to hide, must be removed from every surface. That means good old fashioned elbow grease. Workers use floor cleaner and utility brushes dedicated to floors to scrub out the drains. Workers introduce bioluminescent (light-producing) bacteria to surfaces to detect pre-existing bacterial communities. Amazingly, bacteria light up only when the concentration is high enough. Pretty cool. Even after disassembling, rinsing, scrubbing and detecting, workers use a sanitizer solution in the final rinse to make sure the environment remains unhospitable to microorganisms for the next day. We’re proud to play our part in making sure the U.S. food industry is operating clean facilities and producing safe food for American families by providing professional-grade cleaning products. Contact us to find out how we can help your facility maintain the highest standards of sanitation.